Recently, I, along with what seems like the rest of the world, engaged in excessive debate about one particular dress. To me, the dress was clearly white and gold. However, when I was informed that it is actually black and blue, I was shocked. I began to doubt my own eyes, but found myself fascinated with understanding the science behind how and why we see what we do. Frankly, the petty debate that ensued consumed far too much of everyone’s time, but there are important lessons: perception is not reality, and challenging our beliefs can lead us to new discoveries. I see these lessons at work in health care all the time. Throughout history, we have had some ideas about medicine and health care that now seem absurd. Over time, scientists and doctors who have questioned long-held beliefs have paved the way for newer, more accurate theories that have saved and improved countless lives. In addition to advancing technology, progress in medicine can be attributed to the working and reworking of our understanding of the human body to discover powerful, targeted treatments for disease. Evidence-based medicine is a direct product of setting aside our preconceived notions and letting the data speak. When confronted with evidence that our perceptions and understandings may be incorrect, it can rattle us; those who can adjust are the ones who drive progress and put our new understanding to work effectively. While the science of medicine continues to advance and change, so, too, does how we practice medicine and care for patients. For a long time, we separated providers by specialty, but have now begun to embrace care teams as a more effective way to treat patients, based on evidence from dozens of studies (such as these, on blood pressure control). Our perception that the brain and mental illness were unique and required separate systems of care was challenged by patients, providers, and advocates who saw a connection between mind and body. Today, Colorado is a leader in developing ways to integrate physical and behavioral health care, and if the results are positive, the work could be replicated nationally. Another shift we see great promise in is the growing patient-centeredness of health care. While the health care provider is still widely viewed as the ultimate authority on health and health care, there is now some recognition that patients should have more control and be more engaged in the process. However, measuring its effectiveness is still a challenge. George Bernard Shaw once said, “Progress is impossible without change, and those who cannot change their minds cannot change anything.” It is okay—encouraged even—to change your mind, especially when you discover evidence that contradicts your perspective. At CCMU, we’re committed to challenging our own understanding of how the system works and should work, being open to new ideas and approaches, and using the data and evidence available to evaluate and guide our efforts. 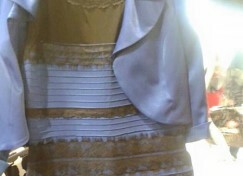 Although, try as I might, I still can’t see that dress as black and blue!